Maybe it’s the kid in me, but I can’t resist a good popsicle when summertime hits. Memories of buying brightly colored popsicles in all shapes, sizes and colors for somewhere between 5 and 25 cents (depending on how good they were) from ice cream trucks in the park come flooding back to me every time. For some time now, most of the do-it-yourself popsicle molds have been plain and don’t inspire the fun that those carefully molded pops did. Tovolo is one manufacturer that goes out of its way to create fun shapes in their molds to make popsicles more exciting. 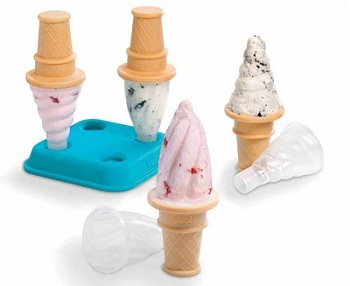 These, Ice Cream Cone Popsicle Molds for instance, are swirly soft serve-shaped popsicles set on top of an ice cream cone-shaped base. It’s easy to handle and oh-so-cute! Tovolo’s molds are sturdy and easy to use, plus they clean up easily when you’re finished. My favorite thing about them is that each mold is separate, so once your popsicles are set, you can take them out of the base and store them singly in the freezer, where they’ll take up almost no space and are ready to go for an easy single-serve snack. Those are beyond adorable, I love it! where do you find this stuff? you’re an endless wealth of baking knowledge and cool gadget knowledge! 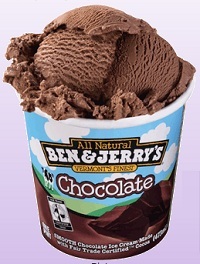 I don’t like Ben & Jerry’s politics so would never buy their products! It is the first time when i see something like that. thanks for this. I have an icecream market and i can use this tips.